Some of my favorite childhood foods still make me “Go Cuckoo for Cocoa Puffs®.” I’m not talking about homemade foods like my mom’s Spaghetti & Meatballs, dad’s beef stew and Aunt Mary Lou’s Fresh Strawberry Pie (although they do). No! I’m talking about the prepackaged types like suzyQ’s, Marshmallow Cream and Shoestring Potatoes. I suppose nostalgia is the reason I decided to recreate the shoestring potatoes of my youth. As a young pup, it was fun popping open the round, cardboard can of matchstick spuds and hearing the pressurized air release. It was even more fun grabbing as many potato sticks, as I could, and stuffing them into my mouth. 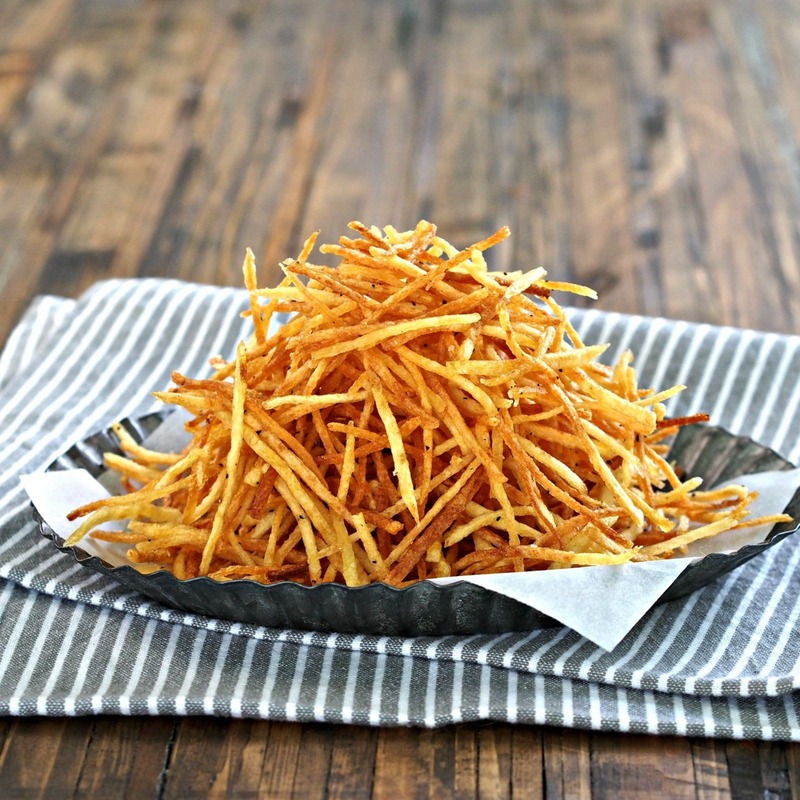 Some childhood foods cannot be replicated, but homemade Crispy Crunchy Shoestring Potatoes are even better than the original. 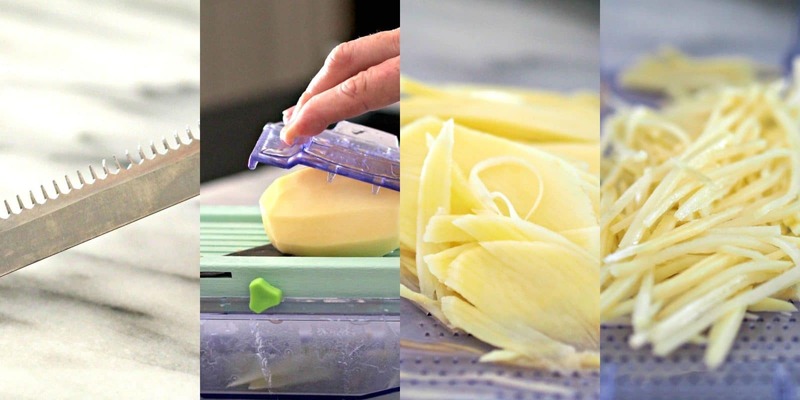 They are also simple to make if…you have a Mandoline slicer. No problem if you don’t have one, but allow a few more minutes for cutting the potatoes into julienne strips. For more information and advice about Mandoline slicers, HERE is a terrific article. One can be purchased very inexpensively, and it is a great tool to have in the kitchen. 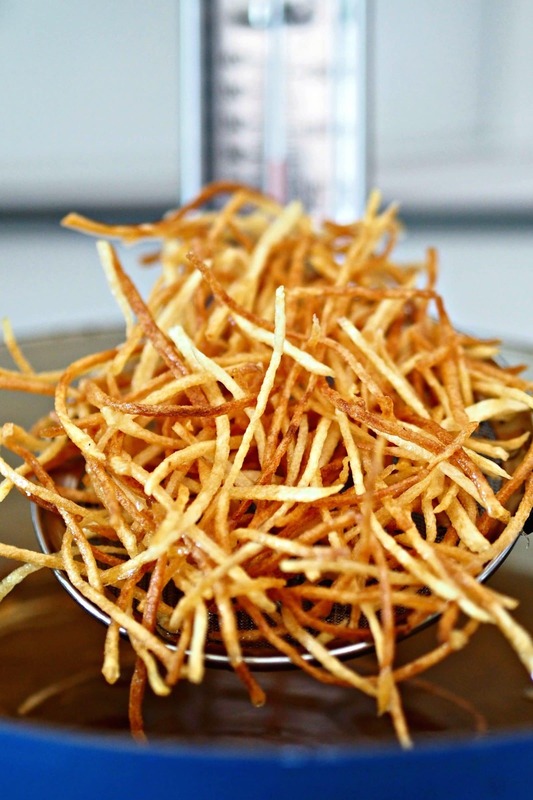 Basic steps for making Crispy Crunchy Shoestring Potatoes are few, but it’s important to follow the instructions closely. Wash and peel the potatoes. Slice the potatoes with a Mandoline slicer fitted with the julienne blade. 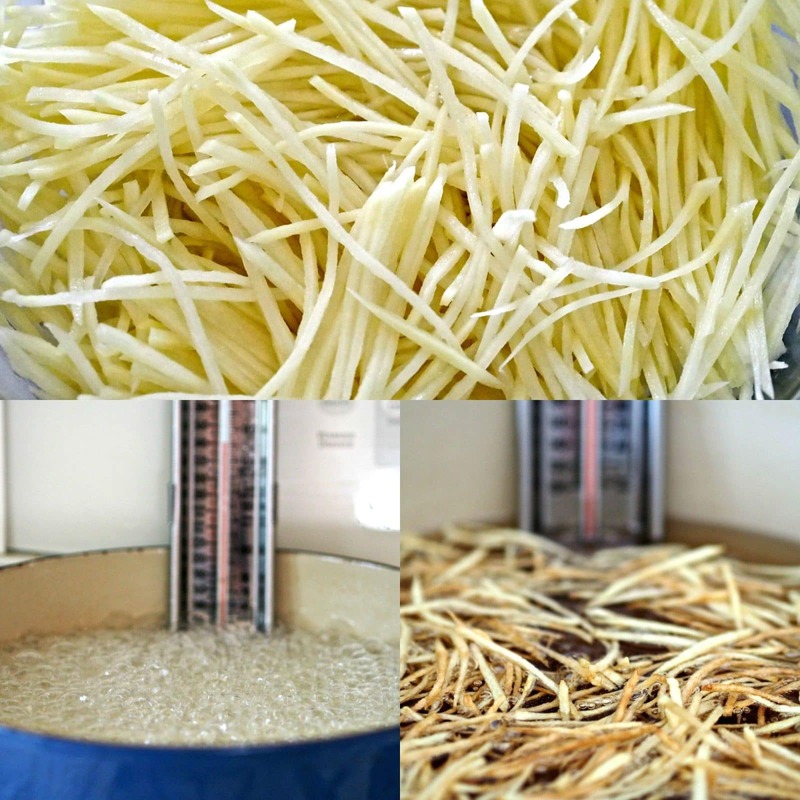 Place potato sticks in a large bowl of ice water to remove excess starches. Heat oil in a large, deep pot to 350F. 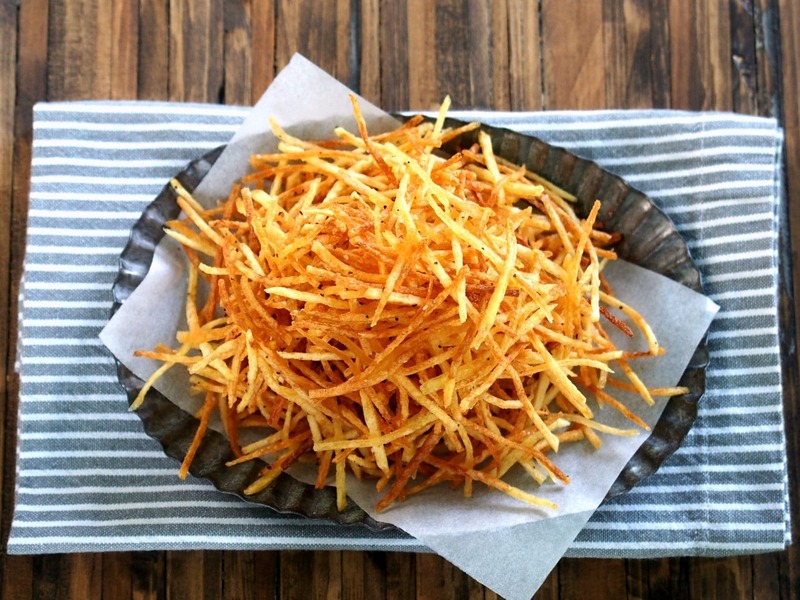 Dry potatoes and deep-fry them (one cup at-a-time) in stages until they turn golden brown. Transfer potatoes to a paper towel-lined plate and season to your heart’s content. 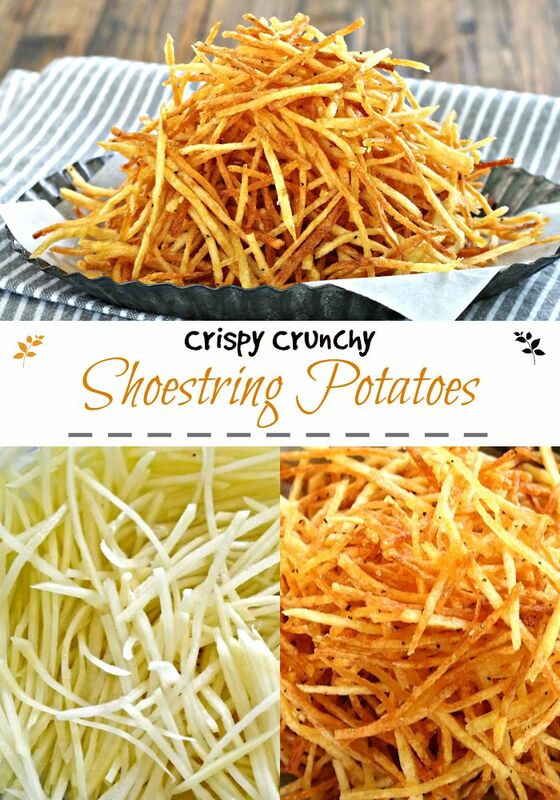 Crispy Crunchy Shoestring Potatoes are true to their name – they are crispy & crunchy and stay perfectly fresh for days. Well, at I can attest to three days – that is the longest time they have lasted in a home occupied by my husband, the salty chips-monster. …just look at this gorgeousness. If you like spicing things up, here are a few ideas that would work well: garlic salt, chili powder, cumin, crushed dried rosemary, grated Parmesan, BBQ spices, seasoning salt, Cajun spices and smoky paprika. If you want to go extreme, make loaded shoestring potatoes by layering them with melted cheese, jalapenos, ground beef, onions – go crazy! 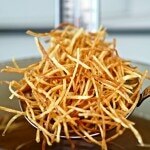 Crispy Crunchy Shoestring Potatoes turned out so well, I’ve decided my next childhood recreation might be suzyQ’s. Although, the spelling is different, we do share the same name, so how can I not? These potatoes are the perfect companion for so many entrees and sandwiches. Try them with Coffee-Crusted Steak, Perfect Skinless Boneless Chicken Breasts, Turkey Parmesan Sliders or Easy French Dip Sandwiches. 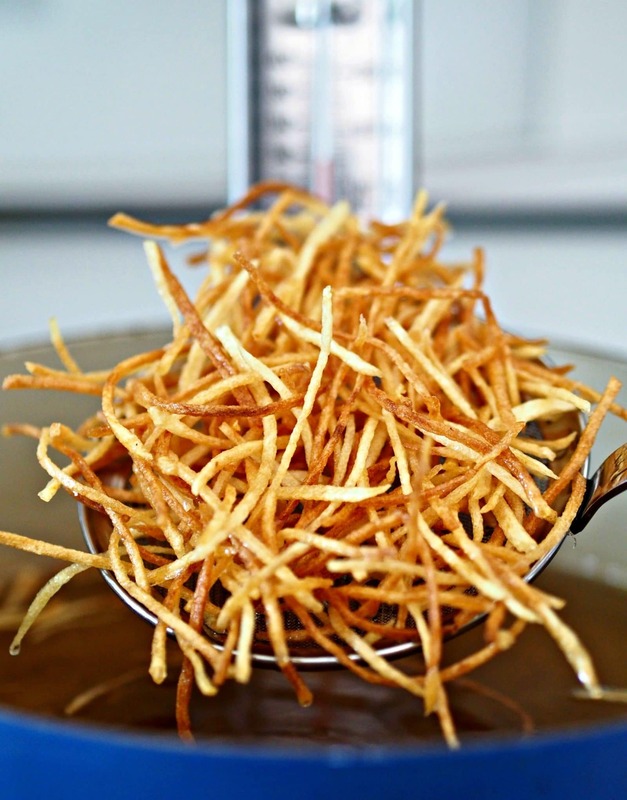 Crispy Crunchy Shoestring Potatoes. Matchstick potatoes deep-fried until golden brown then perfectly seasoned. Simple, delicious and addicting. Optional seasonings: garlic salt chili powder, cumin, crushed dried rosemary, grated Parmesan, BBQ spices, seasoning salt, Cajun spices and smoky paprika. If you want to go extreme, make loaded shoestring potatoes by layering them with melted cheese, jalapenos, ground beef, onions. Place oil in a large, deep, pan, Dutch oven or deep-fryer. Attach a deep-fry thermometer to monitor the temperature and heat oil to 350F. While oil is heating, wash and peel potatoes and remove any dark spots. Using a mandoline slicer fitted with the julienne blade and slice potatoes into matchsticks. Place sliced potatoes in a large bowl of ice water for 10 minutes. Remove potatoes from water bath and place on paper towels or clean dish cloths to dry completely. Pat the potatoes dry or use a salad spinner, if available. The dryer the potatoes, the less excess splattering there will be. The next step is crucial to not having a disaster (or fire) in your kitchen. Do NOT add too many potatoes at one time. Once oil is 350F, place dried potatoes (1-cup at a time) in the oil and stir to separate them. Adjust temperature to keep it as close to 350F as possible. Fry 2 1/2 - 3 1/2 minutes or until dark golden brown – watch closely and stir often.. Transfer cooked potatoes with a slotted spoon to a paper-towel covered surface and season with salt and black pepper. If desired, add other spices or seasonings at this time. Repeat process until all potatoes are fried. Allow potatoes to cool completely, then store in an airtight container. The potatoes will stay crispy and crunchy at least 3 days and probably more. Serve as is or with a side of sweet, hot mustard, bbq sauce or dip of your choice. This look so yummy...cannot wait to try them! 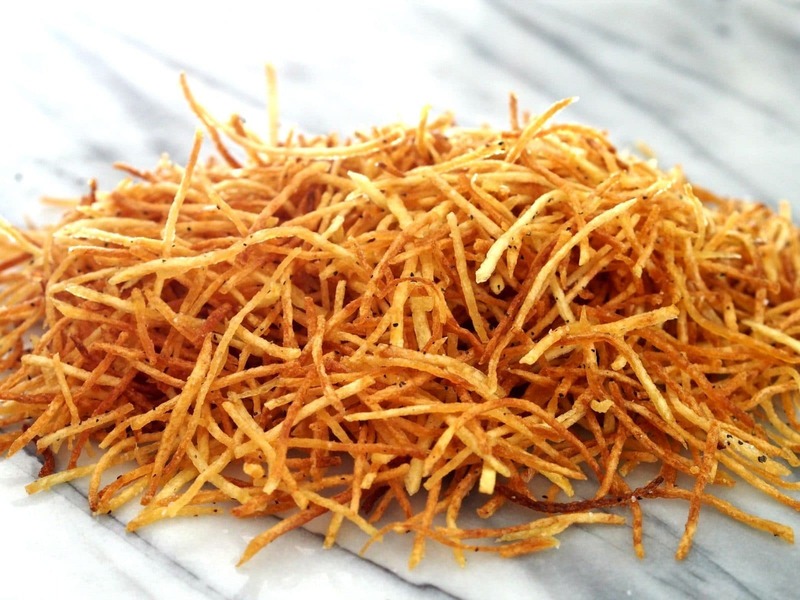 The style & description of the crispy crunchy shoestring potatoes look amazingly good to eat. Thanks Linda!! I know you and Donny will love these. Maybe you can make them for Jen & Daniel!! Susie, my wife and I would go gaga over these. I need that tool. These look awesome! Hey Peter, You do need a mandoline slicer. With all the gorgeous meals you create, it could really save some time. I love mine. Thanks, again, for stopping by today. These look delicious!! I need that tool so I can try them out! Thank you, Becky. I was given my mandoline slicer as a gift a few years ago and have used it so often. It is a great tool to have in the kitchen. I encourage you to read the article in my post (the link is above) -great advice. Thanks for coming by!! Admiring the time and effort you put into your blog and in depth information you present. It's good to come across a blog every once in a while that isn't the same out of date rehashed information. Excellent read! I've saved your site and I'm adding your RSS feeds to my Google account.